Thanks to Mike's Place in Phoenix <http://www.mikes-place.biz/> for providing these differentials to photograph. The poor photography is the fault of the author. 1.8 liter Type I Torsen on the left and 1.6 liter on the right. 1.6 liter viscous limited slip differential (VLSD). If you look in the holes (in real life, not this poor picture), you see spider gears. The sealed viscous unit is off to one side in there. Both 1.8 liter differentials. 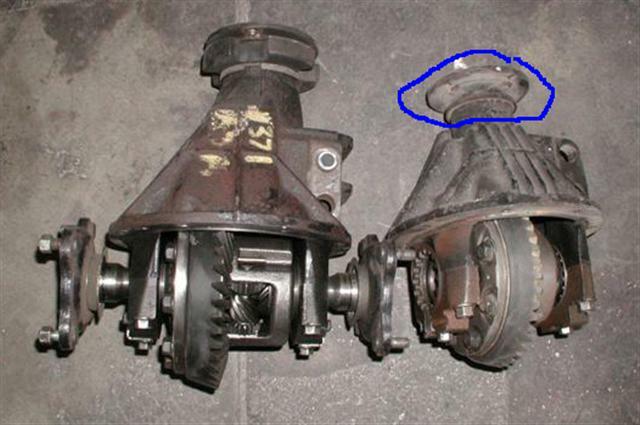 The one on the right is from an automatic transmission car as there is no damper. This means it will not be a Torsen LSD. 1.6 liter finned case VLSD. We know it's a VLSD because the left side stub shaft flange has the ears shown. 1.6 liter VLSD with right side stub shaft flange ears circled. 1.6 liter open differential, left side. 8 identical ears, 4 with studs, same both sides. 1.6 liter smooth case open differential, right side. We know this is a 1.8 liter because it has a pinion damper and stub shafts with four ears, each with a stud in it, but no extra ears in between. It is open, as also circled, are the spider gears. Later 1.8 liter halfshafts, after mid '95 are one piece - without separate stub shafts. 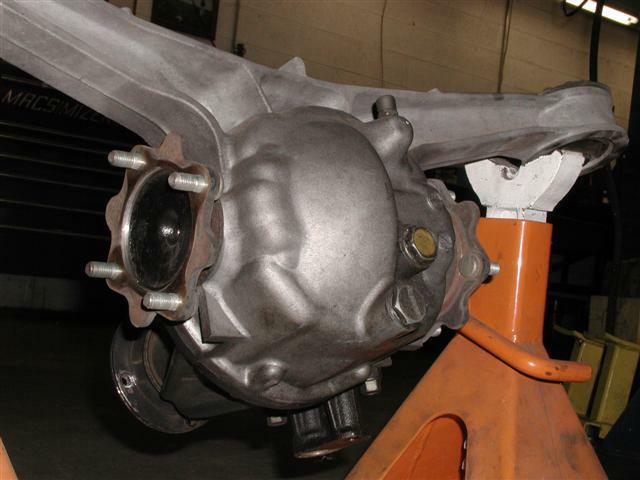 So this is an early 1.8 liter differential. This is a 1.6 VLSD. Arrows indicate two different diameters of splines unique to the VLSD. 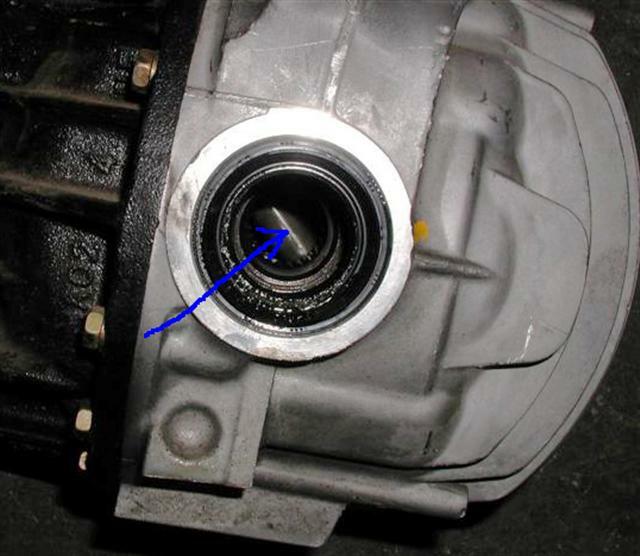 Arrow points to spider gear shaft on this open 1.6 liter differential. 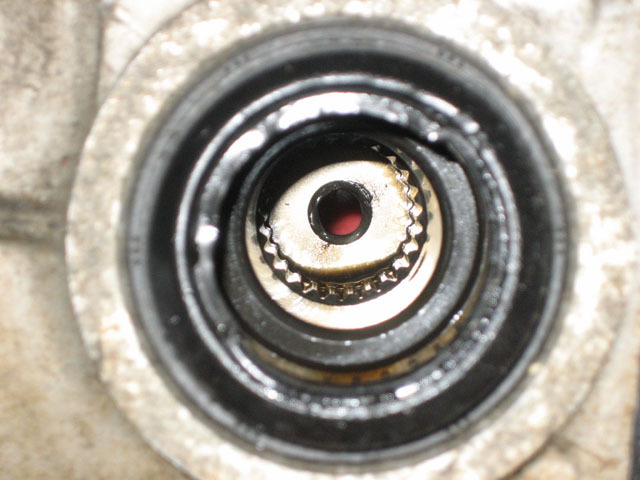 On the right side of the picture, circle indicates broken bearing cap. Refer to image below. 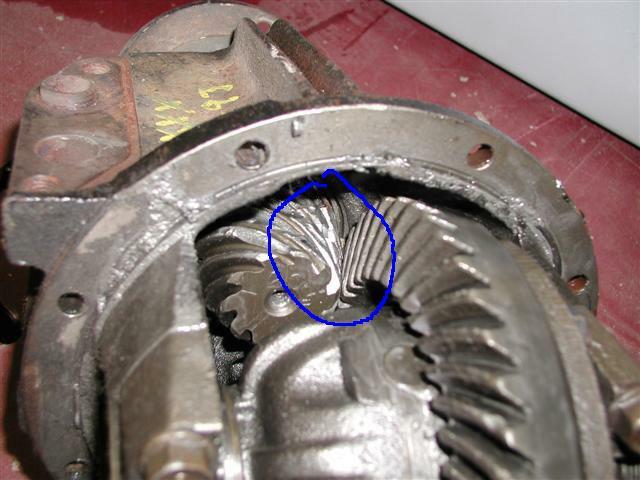 Separation forces broke bearing cap, allowing pinion gear to ride out of ring and break teeth. Loose 1.6 liter VLSD with stub shafts plugged in. All 1.6 liter stub shafts. The two on the left are a VLSD set. Note the right side stub shaft (back left in picture) is the one with two different sized splines. 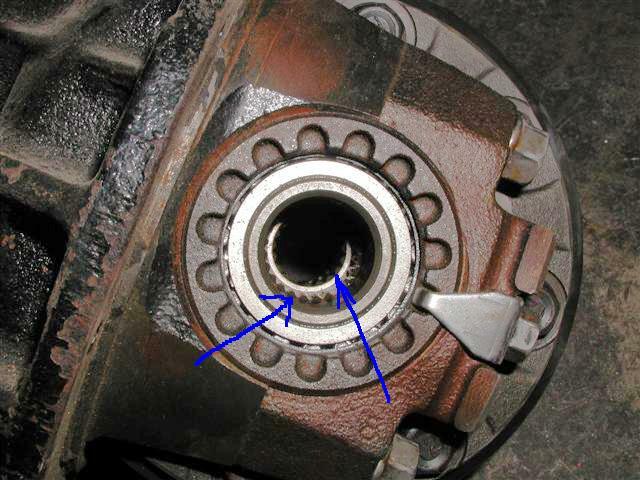 On the right side of the picture are the two matching stub shaft of an open differential. 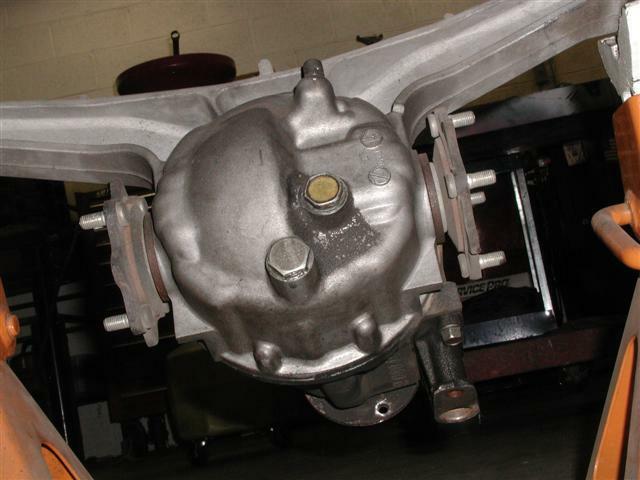 This smooth case is an open differential as can be seen from the stub shaft flanges. Here's what you'll see looking inside the Type II axle holes. 2003+ Tochigi Fuji Super LSD. Torque sensing cone clutch type. 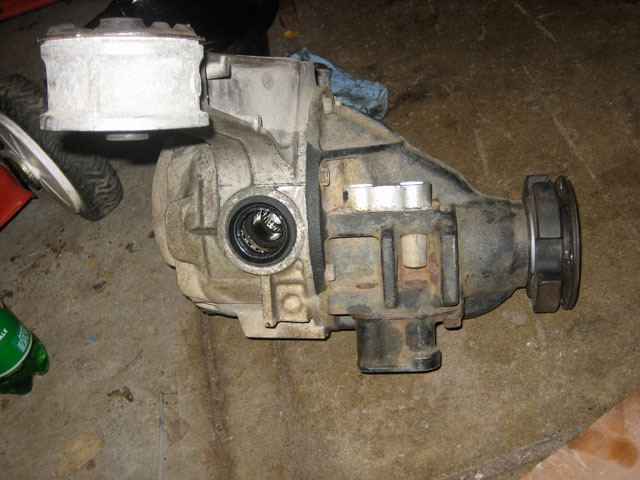 Mazda Miata, ’90 to ’93, used a viscous limited slip differential (VLSD). 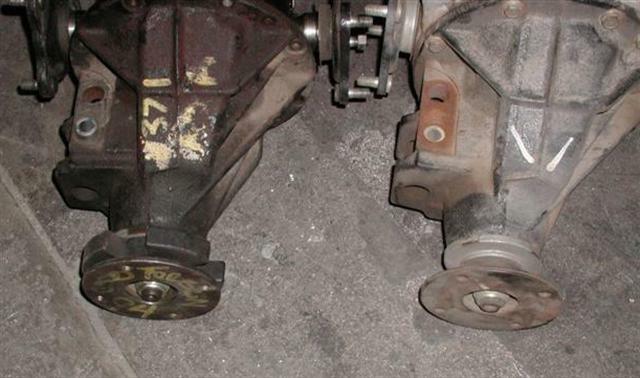 Viscous couplings are generally not well understood and the Miata unit is no exception. First, it is thought to wear out. I think this concept is very overstated here. While there is no clutch plate contact, the usual notion is that the heat cooks the silicone oil and destroys it. This may be true and if so would be evident in demanding competitive applications. However, I suspect the opposite is true. The Miata VLSD doesn't get hot enough during an autocross to work effectively. Which brings us to the second point: the lock-up is lame anyway. Well, not if it's hot enough. Historically, the technical papers that indicate the beginnings of understanding how VLSD work date to the late '80's and early '90's, precisely when Mazda came up with the VLSD in the Miata. And they were proud of it, sending their service technicians to a special course on the VLSD. I remember one dealer mechanic confiding in me, "They were so excited about the VLSD, I thought it would be on every Mazda car..."
Now, the alternating plates in the VLSD are toothed wheels with a couple dozen radial tabs. The reason for this is to eliminate warpage of the plates with temperature. Turns out there was some serendipity to this design. It has long been known that VLSD transmit more torque than estimated by shear forces alone, sometimes 10 or 20 times more torque! But sometimes NO more!(?) Engineers had been muddling along with empirical test results until about the '90's when several scholarly attempts were made to quantify and predict performance. It turns out that the plate tabs twist and shift axially giving rise to all sorts of interesting phenomenon with fluid phase changes, bulk pressure, dissolved air, Coulomb friction, blah blah blah (see SAE 2004-01-0867 - Mohan). The short story is the VLSD differential enters an operating phase Mohan calls "Self-induced Torque Amplification" (STA). This is also described by engineers working with Nissan, Takemura and Niikura, although they call it “hump” (SAE 900558). In any case, the VLSD has 3 phases. 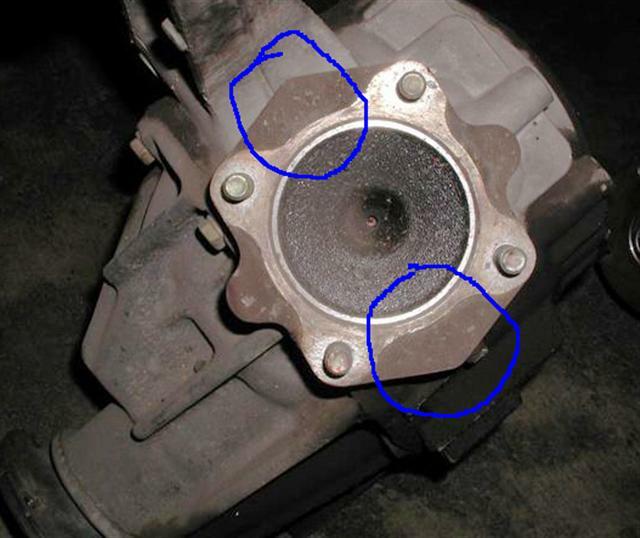 First is initial viscous dissipation where the oil heats and viscosity drops. The VLSD transmits less torque. This is the operation you can measure with a torque wrench as outlined in the Shop Manual and gives rise to the idea that the VLSD is lame. As the fluid heats, the transmitted torque levels and at last in the final phase, as the fluid temperature exceeds 200 C, the torque graph shoots up, with a very steep slope, to transmit 300-400 ft-lbs or more. The ability of the VLSD to transmit this torque will continue as long as the high shear rates are present. To achieve this temperature, the VLSD may have to be subjected to high shear rates for several minutes. Clearly, this is not accomplished at an autocross or even, perhaps, on the track. So, the poor reputation of the VLSD for typical Miata performance applications is supported by the scientific explanation. However, this continuous shearing may be experienced in off-road center differentials and, indeed, Mohan worked for New Venture Gear and viscous differential are still found on 4x4 vehicles here and there. So, the Miata VLSD is probably not weak or broken, just poorly matched to its application. If it DOES break, it can be overheated oil, or broken tabs on the 'clutch' plates, or I suppose the fluid could leak out. In any case, the unit is not serviceable and one suspected of being defective is discarded. 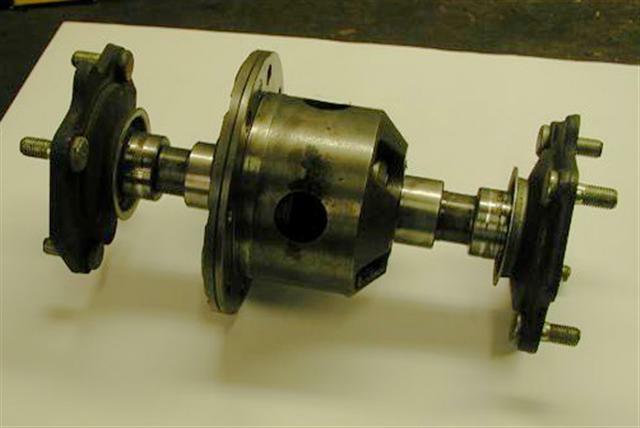 The test for a viscous LSD says a rear wheel must turn no faster than 3.75 rpm with 11 foot pounds of torque on an axle (page M-26 Shop Manual) with both wheels free to rotate and the driveshaft constrained. Although the shop manual does not give any more data points, the resistance to turn should increase with the speed of rotation. Starting with the 1.8 liter in ’94 to ’02, Miatas with LSD have a Torsen. ’94 into ’95 a Torsen Type I and late ’95 to ’02 a Torsen Type II. Open differentials have a torque bias ratio of 1 to 1. That is, they will not distribute more torque to one wheel than the other. It is common to confuse wheel speed with torque. Do not fall into this trap. When one wheel is on ice, it may be rotating very fast indeed, but it does not take a significant amount of torque to turn the wheel on ice. The opposite wheel, on dry land, does not turn because it also has negligible torque (and in this case no speed either). Another way of looking at the same idea is that the open differential can deliver no more than 50 percent of the available torque to any wheel. When both wheels are on a hard surface and the car is pointed straight, this is not a problem. 50 + 50 = 100. As you exit a corner and the lightly loaded inside wheel begins to spin, the torque to the outside wheel drops also. If one wheel is performing at 25 percent, the other is at 25 percent. The rest of the available torque goes to wheel spin or the driver is forced to lift throttle to avoid overreving/spin out. It is the loss of tractive effort from the outside wheel that racers want to eliminate. The spinning of the inside wheel does not matter much by itself. That wheel is lightly loaded anyway and can not contribute much to propelling the car out of the corner. 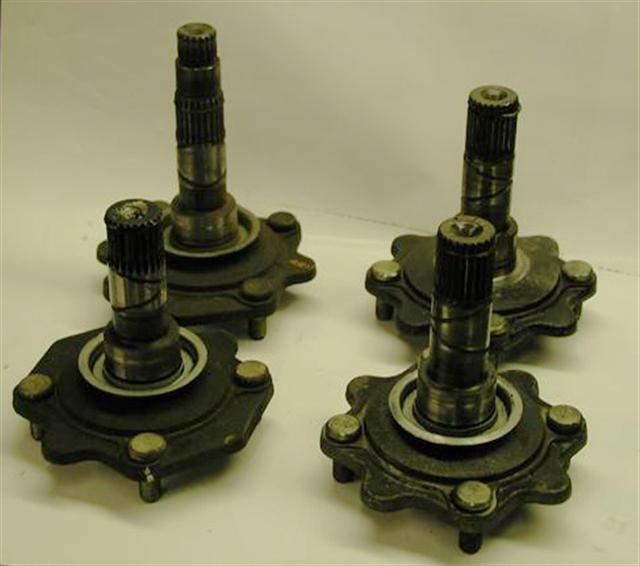 For cars with a solid rear axle, the driveshaft torque also attempts to rotate the axle about the driveshaft axis, lightening the load on the right rear wheel. It is as if the car were turning right even though it is going straight. 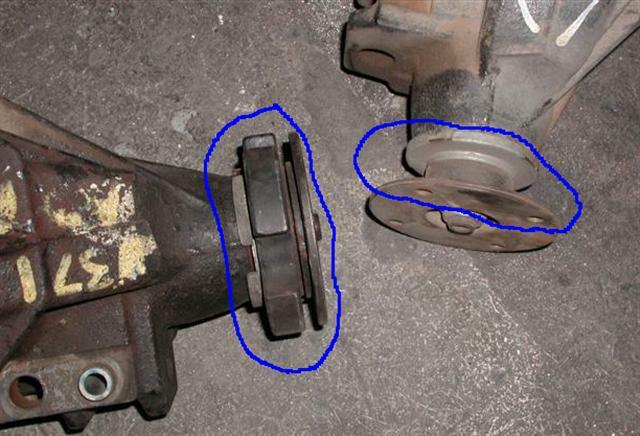 This is a source of annoyance to drag racers who still use one piece rear axles. Performance numbers for open differentials: 1 to 1 torque bias ratio. Since the second ‘1’ in ‘1 to 1’ is implied, sometimes you just see the first number 1 or 1.00 by itself. Sometimes the 50 percent figure is presented (see above) as the maximum amount of driveshaft torque (disregarding the rear end ratio) that can be delivered to any one wheel. 1, 1.00, 50 percent or 0.50 can all mean an open differential. 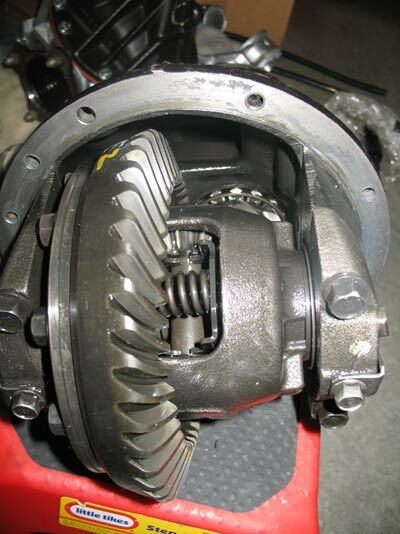 To the driver, the open differential is the safest, most forgiving system. Floor it coming out of a corner and you get less acceleration than you wanted and the outside wheel is still in rolling contact with the road, holding the rear end of the car in line. With the car on a lift with the driveshaft constrained (in gear), turning one rear wheel will cause the other wheel to turn the other way. You should be able to turn it rapidly with relative ease. 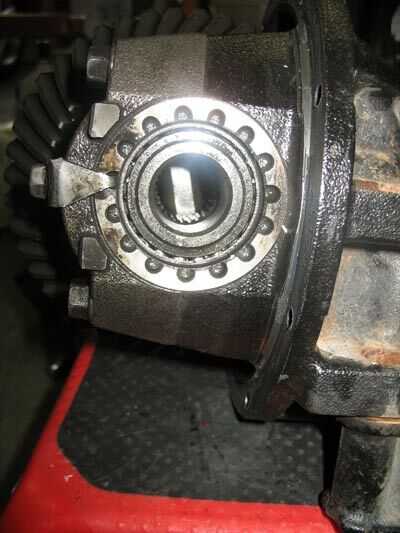 With the driveshaft free to rotate (gearbox in neutral), the internal friction of the open differential is probably not high enough to turn the driveshaft anyway and the result is the same. Included here only for comparative purposes, is the all out racing setup; the spool rear end. The left and right tires are locked together completely, they rotate together. A spool rear end can deliver 100 percent of the available torque to one wheel (The engineer should note the maximum design torque load for a given half shaft has just been doubled!). The torque bias ratio is infinite (100 / zero). Performance number is expressed as 1, 1.00, or 100 percent. A spool equipped car will break both rear wheels loose at the same time, exhibiting power-on oversteer (tail out power slide) exiting corners. Spool cars obtain some semblance of balance with ridiculously stiff front roll bars. This makes sure that as the rear end breaks loose, the weight transfer in the front is 100 percent to the outside wheel, so the front of the car slides away at the same rate. You would not have a spool on your street driven Miata. If a spool is installed and the car is on a lift, the wheels will not turn unless the driveshaft is free to rotate. The wheels always turn in the same direction and speed. There are two types of Torsen (TORque SENsing) differentials. Both are used on the Miata. The torque bias ratio in either case is about 2.5 to 1. This means that the differential is capable of supplying 2.5 times more torque to one wheel than the other. It is important to realize three things: First, the Torsen divides torque without regard to speed difference between the axles. Secondly, it does have a limit of 2.5. If one wheel is in the air or on ice, 2.5 times zero equals zero. The wheel on dry ground gets no torque and you are stranded just like an open differential. However, zero is never exactly zero and the Torsen is very much less likely to leave you stuck than an open differential. But still, if you try to support a torque bias greater then 2.5, the torque applied to the outside wheel will drop. And lastly, the Torsen does have friction clutches with the axial movement of the worm gears (under drive and coast loads) providing the necessary actuating force. 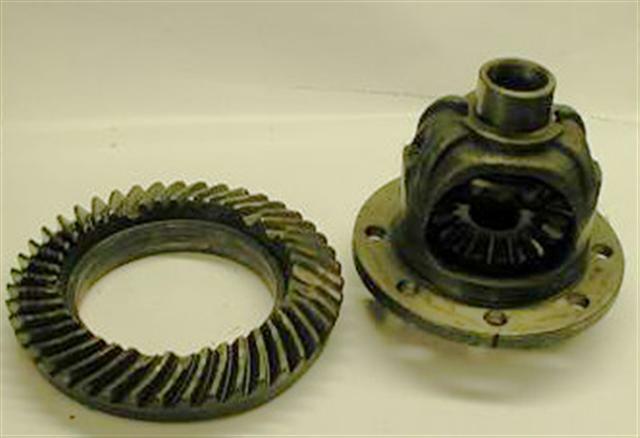 The 1994 and 1995 Miata have a Type I Torsen, which is the traditional worm gear unit. This device can be manufactured with a torque bias between about 2.5 and 5.0. The unit in the Miata is designed to about 2.5 or a little more. I do not have the exact number as it is actually verified through testing on the completed assembly. The 1996 and 1997 Torsen is a Type II. This unit has a different design with the worm gears being replaced by three sets of drive gears that are mounted with their axes parallel to the ring gear axis. It is simpler and less expensive than the Type I to manufacture. The Type II torque bias ratio (TBR)can be manipulated the same way, by changing the amount of helical twist in the drive gears although they are not as worm-like as the Type I. This design can be varied from a 1.0 torque bias (like an open diff) to about 2.5. Again, Miata is using approximately 2.5 or a little less. For racing, the highest permissible torque bias ratio is usually desirable. Since the Type I and Type II are configured for similar torque bias ratios, it doesn’t matter which one you use. The Type II is a fundamentally more robust design, but I have not heard of either unit breaking from track use. They seem to last forever. Off-road is another matter. The Torsen does not take kindly to rotational impact loads. Since a spool will send 100 percent of the torque to one wheel (but has an infinite torque bias), the clutch style limited slip people needed a figure to describe how close their clutch pack approaches a spool. Take a torque bias of 5 to 1 for example: 5/(5+1) = 83 percent. An open differential at torque bias of 1 to 1: 1/(1+1) = 50 percent. Or a spool: infinity/(infinity + 1) = 100 percent. So the “stiffness” of clutch pack limited slip can be expressed as a percentage between 50 and 100. To further complicate matters, the clutch pack limited slip (Kaaz) does not really have a specific torque bias. The clutch pack will support a given torque difference, behaving like a spool, until its threshold is reached. Then it slips, reducing the effective TBR, heats, and wears. To the driver, the car tends to push toward the outside of a turn with application of power. The left and right wheels are coupled together, it wants to go straight. You compensate by increasing the slip angle on the front wheels. When you lift, the front wheels take over, and the car pulls to the inside of the turn. As you approach the cornering limit, the push turns into power-on oversteer. All of this just to get out of the corner faster! And the clutch pack wears out too. 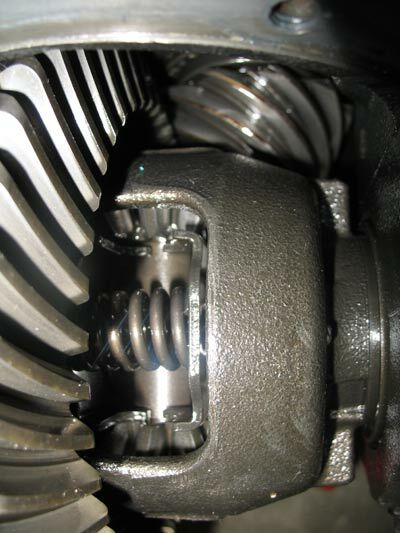 An additive is in the differential oil to allow the clutch pack function in an oil soaked world. By the way, friction modifier will also slightly increase the TBR of the Torsen. 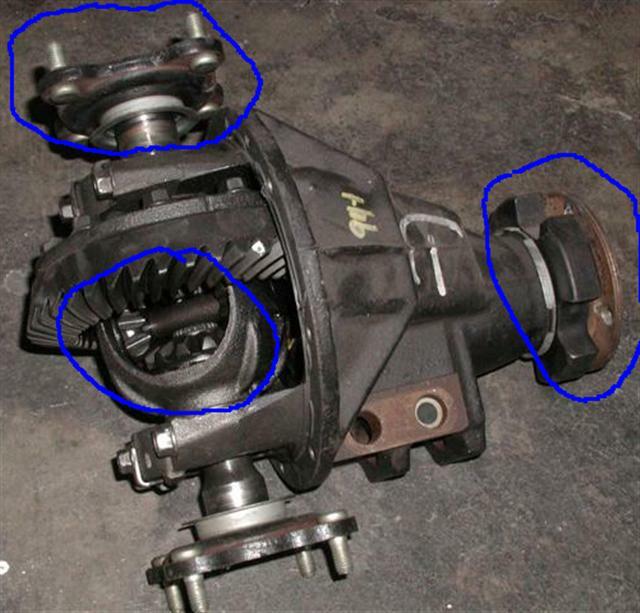 With the car on a lift and driveshaft constrained, a wheel will show a considerable and consistent resistance to rotate (you are slipping the differential clutch). The other wheel turns in the opposite direction. 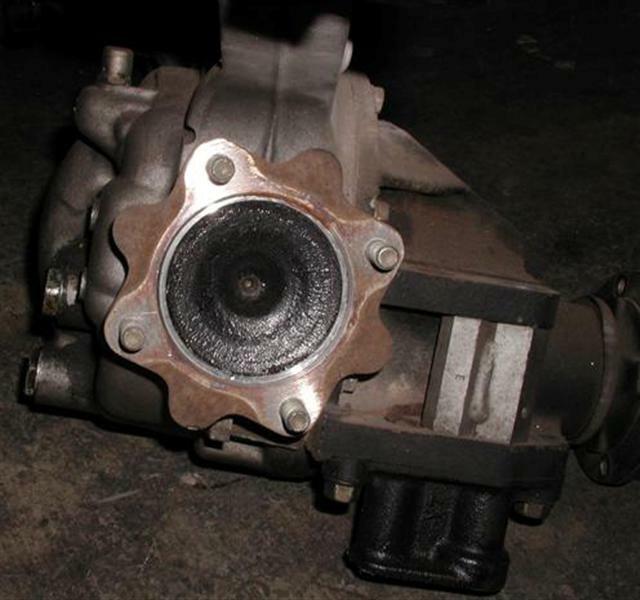 From 1990 to 1993, the Mazda Miata LSD was a viscous unit. This replaces the clutch pack friction material and preload springs with a bizarre fluid between closely spaced rotating plates. One series of plates is connected to each axle shaft. Speed difference between the axles causes the plates to rotate at a rate relative to each other. This shear rate (and shear rate alone) of a thin film of silicone enhanced fluid increases the fluid’s viscosity. Picture a beer mug sliding across the bar on a thin film of water. The increased shear rate (speed of the mug) increases the viscosity of the fluid, creating more friction. This allows the fluid to transmit torque (makes the beer mug harder to push). The beer mug and water really do not behave this way. Neither does gear oil. That is why a special silicone based oil is permanently sealed into the factory LSD unit. 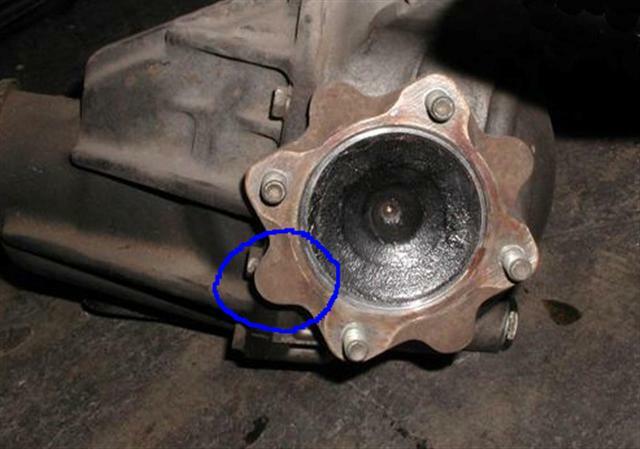 Regular gear oil lubricates the ring and pinion gears. This is a speed sensitive (not torque) system. The difference in axle speed controls the fluid viscosity and degree of TBR. The friction available to the viscous clutch is limited by the operating characteristic of the fluid. At some point, the shear rate heats the fluid too high and it begins to breakdown. The fluid and size and number of the clutch plates limits the torque carrying capacity of the viscous unit. It is excellent for helping a driver start moving from an ice covered road at a stop sign. In all cases of open differentials or traction aiding differentials (Torsen, viscous, or Kaaz) understanding what is going on at one rear wheel require us to know what’s going on at the other rear wheel. For this reason, I don’t see how we can call any of these systems “one wheel drive”. And I have seen traction aiding differentials or transfer cases improperly explained in Road and Track, Car and Driver, and every major four wheel drive magazine. Make of this what you will. For ’03 NB and subsequent, into the NC models the limited slip differential was changed to a Tochigi Fuji Super LSD (What appears to be an adjective, “Super”, is part of the brand name). Well, when is a clutch not a clutch? The Torsen has clutches too, but since they are not obvious and not serviceable, and do not wear out for a long long time, they are ignored. Torsen clutches don't look like clutches either, but rather metal washers. In some cases, even the washer is omitted and the "clutching action" is a rotating gear against a stationary housing. The Tochigi Fuji Super (TFS) uses cone clutches made of metal which I assume is machined to exacting tolerance and hardened. Cone clutches can transmit higher torques for a given diameter than traditional flat plate clutches. Flat plate clutches can increase their capacity by adding plates and selection of materials that have higher friction. Traditional LSD use both of these and it is the wear of the friction material, and reduction of preload, that demands periodic rebuild. 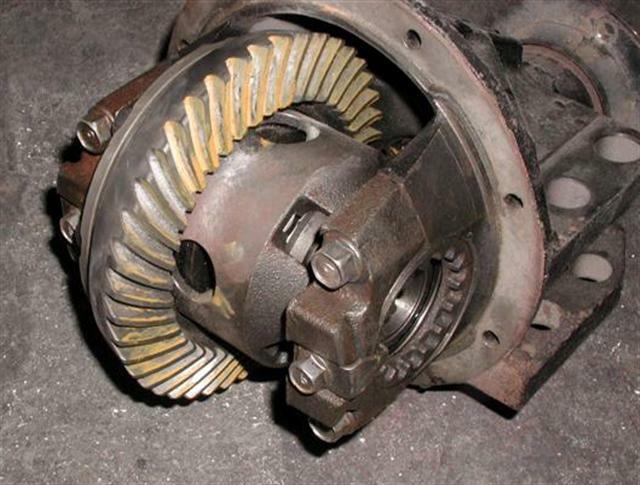 Once we figure out which clutch to use, there is the matter of how to actuate the clutch. Typically a spring provides preload so there is some friction to drive the clutches. From there a ramp, cam, or gear forces provide the muscle to clamp the clutch closed so it can transmit torque from one axle to the other. Often the speed difference between the axles is key to generating this clamping force. This is the reason these LSD are called "speed sensing". The Kaaz uses a ramp. While our TFS uses the force provided by the driving spider gears to spread the side gears. The side gears slide on the splined axle shafts and spread apart. 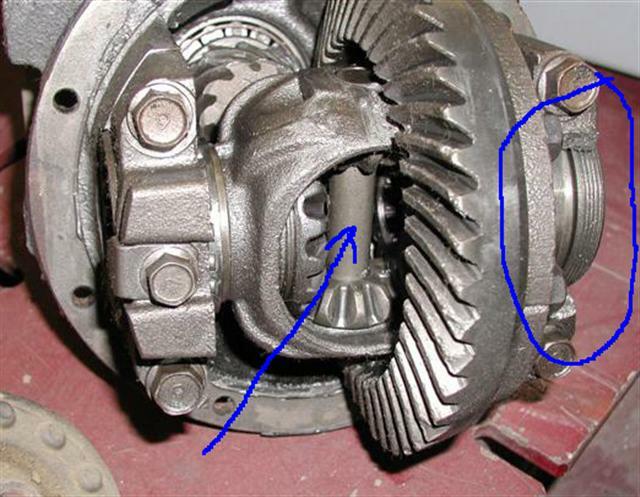 This spreading is constrained by the cone clutches pushing against the differential case (by differential case, I don't mean the housing you see under the car, but the working part of the unit mounted in and spinning with the ring gear). Torsen TBR is about 2.5 to one, decreasing slightly from Type I to Type II Torsen. The TFS has slightly less capability to move torque from one wheel to the other with a TBR of 2.0. To the extent that the TBR is reduced, the LSD becomes less interesting to the competitive driver. Race car guys use an RX7 clutch unit, Kaaz, or a spool. For sporting street use the TBR in the realm of 2.0 to 2.5 is certainly an improvement, while being very unobtrusive. How many people post here that they can't tell if they have a Torsen or not? So, do the TFS clutch cones wear out? Apparently Mazda doesn't think so for a long time since they are not serviceable. Is the TFS "torque sensing"? Well, sort of. Remember the marketing strength of "synthetic" oil, so companies jumped on board with "synthetics" that weren't synthetic? This is the same think. Differential manufacturers have been looking at the real Torsen with their "torque sensing" marketing and have been wanting a piece of that. 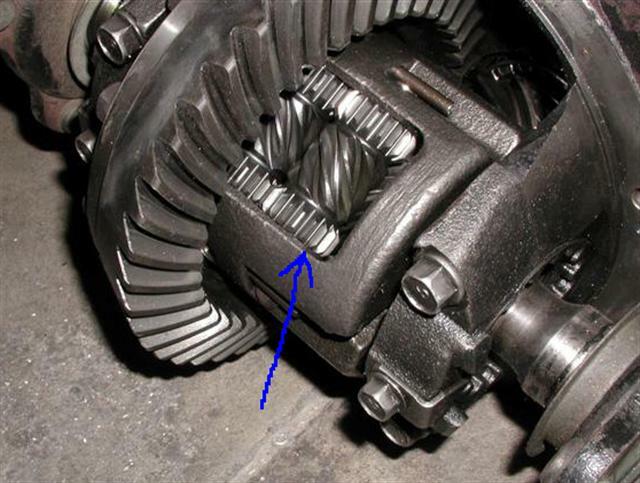 Many types of clutch LSD use the torque coming through the driveshaft to lock the clutch pack tighter. The TFS? THe harder you drive it (torque) the harder it locks, so you can call it torque sensing if you like. The TFS and Torsen do share one characteristic and that is they do not wear (like traditional clutch pack units) during low torque differentiation (coasting in a turn or driving with mismatched tire sizes). 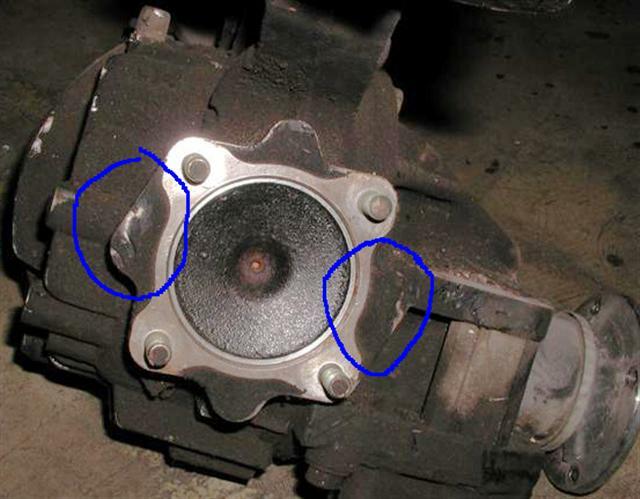 A Kaaz will fry the clutch packs because it is a "speed unit" and it doesn't care or know what torque it is transmitting. To me, a "torque sensing" differential has helical gears, not cone clutches. But, I'd hate to defend that position in court.